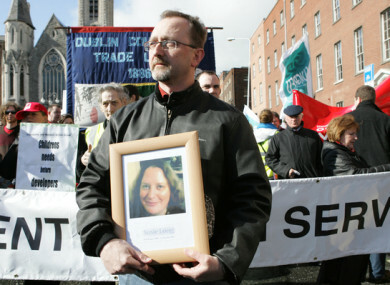 Conor Mac Liam holds a picture of his wife Susie Long at a demonstration in Dublin. THE HUSBAND OF Susie Long, who died 10 years ago after waiting more than seven months for a colonoscopy, has said that a lack of spending in the health service means people are still waiting more than a year for the vital medical exam. The mother of two was referred for a colonoscopy in summer 2005 but had to wait more than seven months on a hospital waiting list to have the procedure. During that time her cancer spread and she died 10 years ago today. She brought the issue of waiting lists to the forefront of the news after she told Joe Duffy’s Liveline programme that she was going to die “because of hospital waiting lists”. Her husband Conor Mac Liam appeared on The Pat Kenny Show on TV3 last night where he spoke about how many of the same problems still persist in the health service. With the total number of people on waiting lists reaching nearly 700,000 he outlined that in the 10 years since his wife’s death there are still people waiting more than a year for a colonoscopy. In Kilkenny we had an endoscopy unit opened in Susie’s name, which is brilliant. I thought it would get rid of the waiting lists. Then I found out afterwards that one of the two endoscopy rooms wasn’t in use because it wasn’t staffed. “It’s clear that there hasn’t been the spend that there should have been in terms of the staffing. Nurses have been having an intolerable time under huge pressure,” Conor added. The programme also heard from people currently on waiting lists in the health service. Pat spoke to Hazel from Longford whose 15-year-old daughter Gypsy has cystic fibrosis. Hazel said her family has basically lived in the health system for the last 15 years as they manage Gypsy’s illness. Despite the fact that Gypsy is in hospital every couple of weeks the family still face a long wait every time she needs medical attention. “So basically what happens is I bring Gypsy up to the hospital, I know she’s sick, the consultants know she’s sick… they say ‘she needs to be hospitalised,’” Hazel explained. Despite this Hazel says that 90% of the time she is told she has to go home again and wait for a phone call to come back up when a bed becomes available. I have to drive from Longford up to Crumlin. I get to Crumlin, get told to go home again, bring my sick child back home again and then wait for days and days. Hazel explained that she also has the option of going through the Emergency Department but because of the severity of her daughter’s illness the risks are too great. Because my daughter has a chronic life threatening illness you literally feel like you’re taking your life into your own hands. I’m terrified, terrified, of bringing my daughter into A&E. Pat also spoke to Elizabeth who suffers from scoliosis. Elizabeth was studying to be a teacher but she had to put her studies on hold because of the severity of her pain. She needs a spinal fusion and because of the complexity of the operation doctors in the Mater hospital decided that she needs to get surgery in the Royal National Orthopaedic Hospital in London. That decision was made in November 2014 and she has now been waiting nearly three years. “Since then I have no life, I’m barely able to get out of bed. I have no social life. I can’t go out with my friends. I literally can’t do anything,” she said. Email “Susie Long's husband says 10 years after her death, people are still stuck on waiting lists”. Feedback on “Susie Long's husband says 10 years after her death, people are still stuck on waiting lists”.